Appalachian Mountain Club, 9781628420067, 288pp. 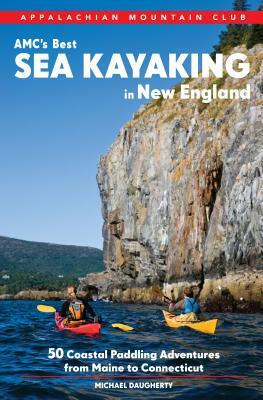 This concise guide, written by Registered Maine Guide and inveterate paddler Michael Daugherty, features 50 of the best sea kayaking adventures along the New England coast, from Maine's Bold Coast south to the mouth of the Connecticut River. These are trips that can be done in a day or turned into an overnight, perfect for beginner to intermediate kayakers looking to explore the storied coastlines of Connecticut, Rhode Island, Massachusetts, New Hampshire, and Maine. The book includes day trips near large northeastern cities like New York City and Boston. Each of the trips features a full description and map of the route, plus bullets on distance and time, where to launch, tide and currents, plan B routes, and nearby attractions. An at-a-glance trip planner and a selection of nature and history essays round out the offerings in this essential sea kayaker's guidebook.Also Available: Quiet Water Maine, 2e by Alex Wilson and John Hayes 978-1-929173-65-5Quiet Water Massachusetts, Connecticut, and Rhode Island, 3e 978-1-628420-00-5AMC's Best Sea Kayaking in the Mid-Atlantic by Michaela Gaaserud 978-1-328420-06-7. SHORT BIO: Michael Daugherty is a Registered Maine Guide and an ACA-certified sea kayaking instructor. He writes for Sea Kayaker, Ocean Paddler and AMC Outdoors magazines and documents his sea kayaking experience online at SeaKayakStonington.blogspot.com. He lives in Stonington, ME.LONG BIO: Michael Daugherty is a Registered Maine Guide and an ACA-certified sea kayaking instructor at Pinniped Kayak. He writes for Sea Kayaker, Ocean Paddler and AMC Outdoors magazines and documents his sea kayaking experiences online at SeaKayakStonington.blogspot.com. He lives in Stonington, ME.